The HubSpot platform has helped thousands of businesses to streamline their marketing strategies over the years. With a patented approach to customer acquisition and sales funnels, HubSpot’s inbound marketing plans have brought success to businesses big and small around the world. But seeing success with your company’s marketing isn’t as simple as just putting a HubSpot portal in place and waiting for the leads to come rolling in. Just as your business adapts and your customer base changes over the years, so must your marketing plans be constantly adjusted and perfected to bring you the best possible results. In this guide, the team at Influence Agents will share with you our tips for auditing and getting the most out of your HubSpot portal. So, let’s get started. The first step of any Hubspot audit is to find out where you're starting from. By taking a look at your marketing performance so far and comparing that to your competitors', industry averages, and your own expectations, we can quickly discover areas fit for improvement. First off, we need to identify your business's current performance in terms of visitors, leads, conversion rate and sales. To find your visitor stats first log in to HubSpot and navigate to Reports > Sources, then choose a date range - the past six months is a good starting point. Next, change Visitors to Contacts/Leads on the same page to get an idea of how many visitors turned into leads. You can then work out your conversion rate with a little simple maths - (Contacts ÷ Visitors) x 100. Finally, still on that same screen, switch Contacts to Customers to see how many leads converted into paying customers. Now that you’ve identified how your current marketing strategy is performing and seen how you stack up against your rivals, it’s time to focus on areas for improvement. Following the HubSpot style, you can now choose to focus on either Attract, Convert, Close, or Delight. If your website is drawing fewer visitors than the industry average, it might be a good idea to take a look at improving the Attract stage of your sales funnel. Likewise, a poor conversion rate could hint at a problem with your Convert tactics, and low sales figures show that your Close strategy needs some work. In the rest of this guide, we’re going to be working through that plan step-by-step, taking a look at how you can improve every stage of your HubSpot sales process. So, you’re having problems attracting visitors to your website? Luckily there are quite a few tried and tested strategies for increasing web traffic. Before we look at those though, you need to set yourself some goals - these will help you to make sure you’re always on the right track with your marketing. Using the SMART system - Specific, Measurable, Achievable, Results-Focussed, Time-Bound - work out some Attract-specific goals for your business. These could be as general as “Increase web traffic by 10% in the next three months”, or as specific and actionable as “create and publish two blog posts per week” - the aim is simply to give yourself something to work towards and a goal to measure your progress against. With SMART goals in mind, it’s time to think about your target audience. Chances are that you’ve already written some buyer personas in the past, outlines of your ideal customer, their likes, dislikes, demography and shopping habits. Take a look at your existing personas and tweak them as necessary to fit what your business looks like today. Everything that your business does as part of its marketing plan should be aimed at one of these buyer personas. By focussing down on exactly who you want to sell to, you can make use of tailored offers and laser-targeted marketing campaigns to bring in more leads and higher conversion rates. The next step is to conduct research into the type of content your business should be producing. In the past, marketing teams would mostly have focussed on keyword research, but as search engine behaviour changes more and more emphasis is being put on so-called topic research. Over the years Google and other leading search engines have witnessed a change in user behaviour. Where once people might have used simple search terms to find the pages they wanted, many users now search by phrase or topic. In HubSpot’s own example, where a user would have once Googled “Somerville restaurants”, they’re now much more likely to search for “Where should I go for dinner?”. To accommodate this change in user behaviour, Google and other search providers have adapted their algorithms to take account of ‘topic clusters’ in addition to traditional keywords. A topic cluster is a collection of content pieces on focussed on similar topics, with one larger and more in-depth piece acting as the ‘pillar content’. Supporting blog posts, guides, articles and other pieces of online content link to the pillar content, and together they help prove to search engines your website’s usefulness to searchers. So, how is this relevant to your business? To keep ahead of your rivals in SEO terms, and to make sure that your site remains competitive on search results pages, you’ll need to start making use of topic clusters in the future. To build up your website’s content library and start working towards a topic cluster approach, you’ll need to brainstorm blog post topics for your writers to produce. Think about the posting schedule that you plan to stick to and consider your content calendar when coming up with blog post ideas - they’ll both inform how many posts you’ll need and what topics need to be covered. If you’re stuck for topic ideas, think back to your buyer personas. What challenges do you customers face? What are the most common questions they ask about your products and services? With content being produced on a regular schedule, it’s time to make sure that you get your blog posts in front of as many potential customers as possible. To do that, we’ll need to develop a promotion strategy. To start with, think about splitting your focus across the main marketing channels - organic search, organic social, paid search and social, and email marketing. A combination of all four of these, mixed and matched as appropriate to your industry and audience, is a good starting point for distributing your content. As time goes on and you learn more about the type of content your audience enjoys and where they interact with it most, you can tailor your promotion strategy further. With a new content strategy in place and clearly identified goals for drawing more visitors to your website, it’s time to think about how we can convert them into leads. Again, we’ll start by generating some SMART goals to help keep your business focused on the task at hand. For the Convert stage of your funnel, your goals could include boosting your conversion rate by 50% by a certain date or securing a certain number of leads - anything goes as long as the goals remain Specific, Measurable, Achievable, Results-Focussed, and Time-Bound. It’s time to take a look at just who is reaching your site as a result of your new online content. Investigate where your site’s visitors and contacts are coming from and what content is bringing them in. Are your new pieces of content finding the right audience? Is the promotion strategy that you put in place bringing you into contact with your target market? Think back to the industry average statistics that we looked up at the start of this audit and compare your own findings against them, that will give you an idea of how your new strategy is starting to perform. If you find that your conversion rates are still stubbornly low, or you think you might not be reaching the right audience, it could be time to take another look at your lead magnets and CTAs. Start by working out where each of your existing content pieces sits in the buyer journey or sales funnel. CTAs within those pieces of published content should be appropriate to both the buyer and their stage of the funnel - it’s easy to get this wrong, but showing the wrong offers to the wrong customers could be holding back your business. Audit the rest of your online content too, including thank you pages, any forms on your website, eBooks, whitepapers and other resources. Every one of these should be focussed on your ideal buyer persona and geared towards moving leads down the sales funnel. Whether you’ve discovered that your current content doesn’t cover every step of the buying process, or you’re just interested in targeting new customers with new offers, you can now start to plan a new content piece. To help with the planning process for your new content, let’s make use of HubSpot’s Page Performance Tool. Start off by navigating to Reports > Page Performance, then filter by blog posts in the past six months. Checking your current content by page views will give you a good idea of the type of content that your audience enjoys reading and the offerings which are bringing you the best results. Then, with a potentially high-converting content piece in mind, it’s time to think about a distribution and promotion strategy using the ideas we spoke about in the Attract stage. By working your new offer into your existing schedule, you can use a mixture of email, paid and organic social, search traffic and other means to get your new content in front of the right audience. We’ve identified new ways to bring traffic to your site and audited your company’s content to boost your conversion rates. Now, it’s time to look at how to close the sale and turn those visitors and leads into paying customers. To get started, think back to the previous sections and establish some more SMART goals for your team to follow. This time goals could include boosting company revenue by 5% over a certain time period, making three sales in the next month, or setting larger sales targets for your business. Again, setting actionable goals for your business will help to keep you on track and give you something to work towards. With goals in mind and a strategy in place, your business will be much better placed to hit your targets than a business with no structure behind it. The first step to securing more sales is to make sure that your business’s sales funnel is still in place and is being followed by your leads. Just like we did during the Convert stage of this audit, take a look back through all of your existing content and any new content due to be published soon. This time, think about where in the sales funnel these pieces sit, and whether the customers who see them will be at the same stage of the funnel. If a lead is already at the Decision stage of a purchase, sending them content targeted at Awareness customers is unlikely to promote a response. Conversion forms have a large role to play in this audit, and making sure that your forms are targeted correctly and ask the right questions to the right customers is key to closing sales. Audit these forms wherever they appear, whether on your website, emails or eBooks, and tailor the questions to the stage at which that content is targeted. As a general rule, Awareness stage forms should focus on basic details like name, email address, and reasons for them to be interested in your product. The Consideration stage can include more corporate information, location and budget, while Decision stage forms should collect any final information your business needs to make a sale. Take conversions to the next level by adopting a thorough and well-considered approach to lead scoring. If your license allows, check in on those contacts in your portal with the highest likelihood to convert, using HubSpot's predictive lead scoring mechanism, which automatically calculates the "heat" of your prospects by taking into account their recent activities and behaviours on-site and via communications channels with your business. With your sales funnel in order and a reliable stream of leads coming in, it’s time to look at how we can use all of the customer information that you’ve been collecting through your conversion forms. Using these customer segments we can then start to produce and send highly targeted emails to precise sections of our lead lists. As customers and businesses increasingly prefer email to cold calls, we can use the information that we’ve collected through forms to write persuasive, targeted and relevant emails to customers that we think are likely to convert. By using an email template like the one above, with the blanks filled with your lead’s personal information, you can increase your chances of turning a contact into a sale. If your lead list is particularly small, you could also experiment with writing out every email manually, giving you the chance to tailor it precisely to your target. So far we’ve been looking at how to turn website visitors into paying customers, but now we’ll talk about how to maintain those customer relationships and use them to continue building your business. Perhaps the best tool for engaging with your customers and exposing past-customers to future ones is with the use of social media. Whether you make use of Twitter, Facebook, LinkedIn or some other platform, social media gives you a space to share success stories, to talk directly with your customers and to quickly answer questions from would-be buyers. These platforms also give you the means to put customer feedback out in the open for other potential customers to see. By building a community of happy customers, any lead currently moving along the buyer journey can be encouraged to take action. Just because a customer has completed a purchase from your business doesn’t mean that they want nothing more to do with you. In fact, in many cases customers will continue to visit a business’s website for a long time after they have completed a purchase, staying up-to-date with new releases, reading guides and eBooks about services that they’ve purchased, and considering other products from a business that they now trust. Make sure that your content is always available on your website to past customers. This content can be regularly shared via social media too, and even made available as downloads to make sure that past customers are always kept up to date and happy. Throughout this guide we’ve taken a look at the four main steps of your marketing plan - attracting visitors, converting them to leads, closing sales and maintaining customer relationships. 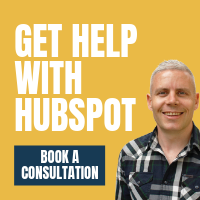 If you’ve followed the steps in this guide you should now be well on your way to auditing and perfecting your HubSpot portal and your business’s marketing plan. Implement the strategies we’ve outlined here, adapt your business’s marketing and sales offering, and watch your conversion rates and sales figures soar. Oh, and if you feel like you need a helping hand when navigating your way to portal success, you can find out more about our HubSpot marketing services, here, and if you're considering working with a specialist outsourced team, then check out our Ultimate Guide to Hiring an Inbound agency.